What To Know About Rental Agreement In Sikkim? Be it be the capital Gangtok or be it be a small town Pelling, setting up a rental agreement is inescapable. Have been declared the first “organic state” of the country, almost half of the population depends on agriculture for their livelihood. You could be a farmer, a family man or a student looking for a rental stay. This would call for you to create a lease agreement. Now, creating a rental agreement is very simple with the help of LegalDesk.com. The Sikkim Regulation of Transfer and use of Land Act, 1975, is the primary law governing the setting up of a rental agreement in Sikkim. A rental agreement/lease agreement is a contract that is set up between the landlord and the tenant whereby the landlord gives the tenant the consent to reside in his residential premises. Creating a lease agreement is necessary if you have moved to a new place. To create a lease agreement follow the given steps. Draft a document with accurate details of the landlord, the tenant, and the property to be rented. Accurate details: The details given in the contract should be best to the knowledge of both the landlord and the tenant. Notice period: Notice period is a particular period before which the tenant has to inform the landlord about any intention regarding termination of the agreement. Lock in period: Lock in period is the minimum time before which neither the owner nor the tenant is allowed to withdraw the agreement. Security deposit: The tenant pays a security deposit to the landlord when the tenant decides to move into the residential premises. The landlord should pay back the whole amount when the agreement expires, except for the charges that are caused due to the ill regard of the tenant. This serves as a security to the landlord in case the tenant breaks or violates the terms of the lease. Penalty: The landlord is allowed to impose a certain amount as penalty charges if the tenant fails to pay the rent within the stipulated time. Rent: The rental agreement should mention the rent amount. This serves as a protect to the tenant just in case the landlord decides to increase the rent by a large margin. Maintenance charges: The landlord is expected to take care of all the maintenance charges unless specified otherwise in the agreement. Pets: The landlord can mention if he allows pets inside the residential premises. Parking and other facilities: The rental agreement should mention if the landlord provides the tenant with parking or any other facilities. You can add any other clause that you find is essential to be referred in your rental agreement. There are three types of lease agreement. They are as follows. 11-month rental agreement: This is a short time rental agreement that expires within 11-months. However, the agreement could be renewed if both the landlord and the tenant wishes to do so. The 11-month rental agreement is preferred over the others as this lease agreement does not require registration. Long-term agreement: Any other rental agreement exceeding a term of a year comes under the long-term contract. This could be a year, five years, ten years or anything beyond. This agreement is usually opted by the tenant for residential purposes. Commercial agreement: A commercial agreement is one in which the landlord lends the tenant the property for business purposes. The agreement could be personalised as per the requirement of the business. Stamp duty is the amount which the tenant pays to the government to make the document legally valid. This is done by purchasing the stamp paper of the recommended value and printing the rental agreement on it. Registering your lease agreement makes your document legal. A document which is legally registering will have more of a weightage just in case a dispute happens in the future. An 11-month lease agreement/a short-term agreement does not require registration. However, it will be better if registered in case of any unstipulated problems arise. In India, notarization is mandatory only for certain affidavits. However, notarizing your document provides an additional verification to the details that are given in the rental agreement. But it is not a mandatory step to be followed. To notarise, take the ready rental agreement to a nearest Notary Public and get it attested by him/her. Creating a rental agreement is a tiresome and tedious process. Now, it could be done very easily with the help of LegalDesk.com. To create a rental agreement online, follow the steps given below. Visit LegalDesk.com and view our lawyer verified, ready to customise rental agreement. Fill in the accurate details of the landlord, the tenant and the property to be rented. Personalise your document by adding necessary clauses. Print the agreement on a stamp paper of the recommended value or allow us to do so and deliver it to your doorstep. We work to make your lives easier. Visit our page of ready to customise online legal documents and you’d be surprised to see how quickly you could create the various legal documents. We do provide provisions to make your affidavits, non-disclosure agreement, job offer and employment contracts and many others. 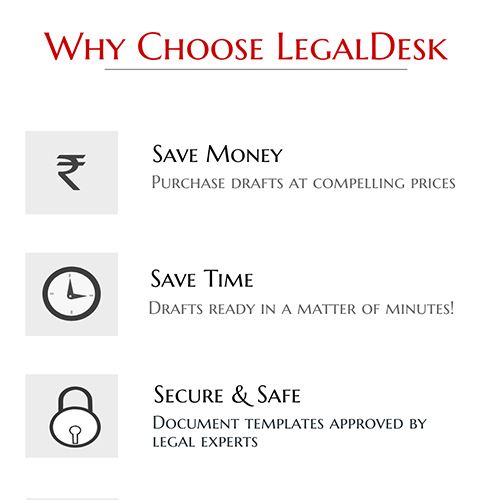 In case of any queries, do mail us at support@legaldesk.com. There are 0 comments on "Rental Agreement In Sikkim".